Prepare the marinade by blending the shoyu, water, malt syrup, garlic, olive oil and lemon juice. Pour into a shallow baking dish. If using bamboo skewers, soak them in water for 20 minutes before using to prevent them from burning on the grill. 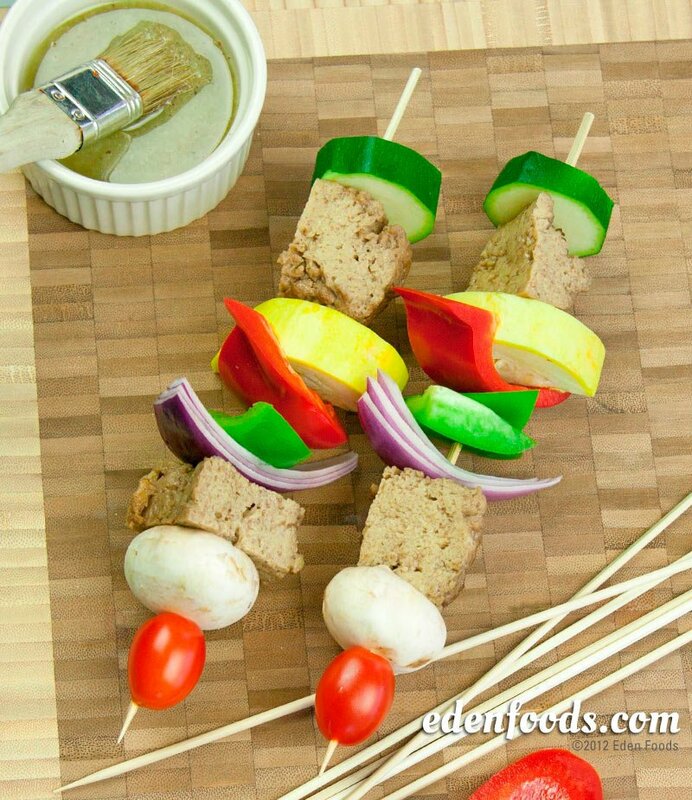 Place equal portions of all vegetables and seitan chunks on the skewers. Place the skewers in the marinade, turning them periodically, and allow to marinate for 20 minutes. Place kebobs on a grill rack and brush them with remaining marinade. Cook about 5 minutes, turning occasionally. Remove and place on a serving platter. Delicious served with Eden's Minted Quinoa with Crunchy Pine Nuts. Please see recipe. Tofu, tempeh or seafood may be substituted for the seitan in this recipe. If using tempeh, boil for 15 minutes before grilling.